Northampton withstood a remarkable London Irish fightback to return to winning ways at Franklin's Gardens. Jamie Elliott twice touched down, either side of Kahn Fotuali'i's try, to give the hosts a 24-0 half-time lead. Salesi Ma'afu then forced his way through to wrap up a bonus point within 60 seconds of the restart. But Saints had to survive a scare, with Andy Fenby, Shane Geraghty and Jebb Sinclair crossing for Irish, before a late Alex Waller try ended the contest. It could have been even worse for Northampton had Marland Yarde's try under the posts with 10 minutes remaining not been disallowed for a forward pass, but the hosts escaped with victory to stretch their lead over third-placed Bath to seven points. Coming into the game, Jim Mallinder's side, who had lost three Premiership matches in a row, still needed two wins from their remaining three fixtures to secure a top-two place and subsequent home semi-final in the play-offs. And, until an amazing final 20 minutes, they never looked in any real trouble as they went about chalking off one of those victories against the Exiles, who remain 10th in the table with seemingly little to play for. Stephen Myler, in kicking nine points against the Exiles, passed 1,000 Premiership points for Northampton - only the second Saint to do so, after Paul Grayson. Stephen Myler's well-struck penalty gave the hosts an early lead, and their advantage was increased a couple of minutes later when Elliott grabbed his first try of the match. Myler's kick forward was only half charged down by Tomas O'Leary, and Elliott stole in to finish from 30 metres, though replays suggested the 21-year-old winger failed to successfully ground the ball beneath the posts. There was an element of fortune about Saints' second score too. O'Leary, this time trying to clear the ball from inside the Exiles' 22, saw his own kick blocked by Northampton captain Tom Wood, and a lucky bounce allowed Fotuali'i to run through unchallenged. Elliott then grabbed his second try of the match, smartly finishing a fine move which saw the ball moved from left to right, to confirm the home side's dominance heading towards the interval. And Northampton's fourth score came just moments into the second period, Burrell's brilliant break setting up the opportunity and, having switched the ball across to the right, Ma'afu bundled his way through to secure the bonus point. But Burrell was at fault when London Irish registered their first try of the match with an hour on the clock - an error which appeared to spark the Exiles into life. 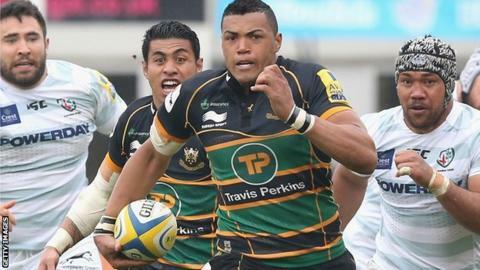 With victory over London Irish, Northampton ended a run of three successive Premiership losses, having suffered defeats by Saracens, Sale and Leicester. Having got back well to cover Fenby's poke through, the England centre surprisingly chose to hack the ball in-field rather than into touch, and the former Scarlets winger capitalised to latch onto his own kick and stroll through. Geraghty, whose conversion was successful, then stole the ball after some sloppy Saints passing to charge through unchallenged from 80 metres out to keep the visitors in the game. And, after Northampton prop Alex Waller saw yellow for kicking the ball away on the floor, replacement Sinclair bundled his way over for a third Irish try in an amazing eight-minute spell. But, once Yarde's potentially match-equalising try was disallowed by the television match official, the visitors ran out of steam and Waller's last-minute score in the corner confirmed the result beyond any doubt. "We need to be better than that when we come up against the big sides. "At half-time we spoke about keeping that intensity to our game and we did for the first 10 minutes - we got the fourth try and then we seemed to switch off. "It is really disappointing as it was a game which could have been a convincing win, but ends up being in the balance. "I was delighted to see the referee refer the Yarland 'try', we were very grateful to see it called forward." "Some days you get the tick and some days you get the cross, we were playing away so it was understandable we got the cross today. "We rallied really well in the second half, but we can't be happy with the first half. "We made lots of skill errors and they feasted on them." Northampton: Foden; Elliott, Pisi, Burrell, North; Myler, Fotuali'i; A. Waller, McMillan, Ma'afu; Manoa, Lawes; Wood (capt), Dowson, Dickinson. Replacements: Clark for Manoa (40), Denman for Ma'afu (55), E. Waller for A. Waller (55), Williams for Clark (61), Wilson for Foden (61), A. Waller for E. Waller (64), Clark for McMillan (68), McMillan for Williams (69) Van Velze for Ma'afu (77). Not used: Hooley, Day. Sin Bin: A. Waller (66). London Irish: Lewington; Yarde, Mulchrone, Sheridan, Fenby; Geraghty (capt), O'Leary; Parr, Mayhew, Halavatau; Low, Rouse; Cowan, Ellis, Treviranus. Replacements: Evans for Low (31), Stevens for Mayhew (40), Hagan for Halavatau (40), Allinson for O'Leary (40), Homer for Lewington (40), Sinclair for Cowan (50), Parr for Harris (71), Dorrian for Geraghty (73).